I’ve been wanting to read this book for ages after I started hearing people raving about it on lots of my favourite podcasts. I’m so glad I finally got around to reading it because this is exactly the kind of book I love. The highest praise I can give this book is that the voice and style reminded me of Anne Tyler who is probably my favourite author. Just as a Tyler does, Ng is able to describe the small family dramas of suburban life beautifully. She also does a wonderful job of capturing the peculiar heartbreak of longing for a child, losing a child and of actually parenting a child and how the fear of losing that child can impact negatively your ability to parent well. I felt personally touched by the stories of women suffering fertility problems and miscarriages, it’s quite rare to read about this topic in an understated, realistic way which captures this awful but normal pain. I loved the 90’s setting of this book which meant the teenagers in this book are the same age I was at that time, so I understood all the cultural references perfectly. I could also totally picture Shaker Heights, the Ohio community where the book is set from Ng’s descriptions. The novel follows the lives of two families living in Shaker Heights, the Richardsons and the Warrens, and how their lives intersect over the course of about a year. There’s also a really thought-provoking sub-plot about the adoption of a Chinese baby and whether she would be better off with a wealthy white family or growing up in her own culture with her struggling single-mother. This sub-plot is treated in an incredibly even-handed way. I was slightly disappointed by the ending of the book as I hoping for a bit more face to face conflict. The book starts with the Richardson’s youngest daughter burning down their house with her mother inside and then sets out the explain the events which led up to this. I was expecting a more dramatic provocation for this dangerous and irresponsible act and I didn’t really feel that anything that happened in the book warranted this outcome. I wanted a bit more of a showdown between the characters but I suppose it is ultimately realistic and people do just move on from each other’s lives without the having the opportunity to say everything they feel to each other. I will definitely search out more books by this author as I loved her writing style, voice and the subject matter of this book. It’s structured really well and is thought-provoking about issues without being polemical. 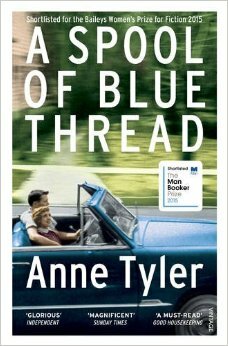 Anne Tyler is one of my very favourite authors. She is fabulous at creating narratives about the intricacies of family dynamics, including oddball characters and the complicated ways in which people love each other. So I was eagerly anticipating the paperback release of her latest novel, which at the time I believed was to be her last, although happily it is not. I often find with Tyler’s novels that I really enjoy reading the book but I’m left disappointed by the ending. This was the case with this book. The novel paints a portrait of the Whitshank family over four generations and the house in which they live. I really liked reading about the modern day family, but I was less interested in the older generation which is the focus of the last third of the book so I found my enjoyment drifted towards the end. Rather than having a driving narrative plot, it is more a series of vignettes about important moments in the family’s life. I would have preferred if the book had just stayed in the present day and delved more into the motivations and peculiarities of the family members the book portrayed at its beginning, with whom I felt very engaged. However, I cannot deny the quality of Tyler’s writing and her ability to create real multi-layered characters and amusing, touching family situations.